1 May 2010: Confronting climate change is a top priority for the government of Mexico City. With the city’s Green Plan (Plan Verde), Mayor Marcelo Ebrard and his team have introduced a number of measures to cut the emission of greenhouse gases, reduce traffic congestion and preserve water resources. Such measures often require considerable sacrifices before they produce benefits. 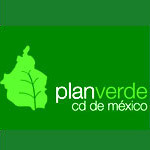 In an interview with City Mayor’s Latin American Correspondent, Mexico City’s Minister of the Environment, Martha Delgado, described the extent of the challenge, outlined details of the Green Plan and explained how the city government communicates with residents. Mexico City has been the subject of environmental concern for over two decades. In 1990, there were a total of 333 days (or 92.2 per cent of the entire year) during which the ozone level was above the Mexican national standard, which is 0.110 parts per million. “We couldn’t even see our astonishing volcanoes the Popocateptl and Iztacicihuatl because of the polluted air,” the Minister told City Mayors. In 2009 the number of days in which the ozone level was above the standard fell to 180. In addition, the number of average hours per day that the ozone standard is above the norm has also fallen over the same period - from an average of 4.9 hours per day in 1990, to 1.5 hours per day in 2009. Other pollutants, including carbon dioxide and lead, have also fallen significantly. Still there are lots of challenges as Mexico City faces every day serious environmental problems. 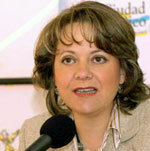 Minister Martha Delgado is one of the most prominent leaders of the environmental movement participating in Mexican politics today. Among many activities, she has led the Confederation of Environmentalist Groups, one of the most important environmentalist networks in Mexico representing 85 NGO’s in the country. As advisor to the President of the National Ecology Institute, she has worked towards decentralizing environmental management and building consensus for decrees that have established new natural protected areas. With a nervous smile, she recognizes that Mayor Ebrard jokingly blames her every time his popularity rate drops. “I know that sometimes we need to make unpopular decisions in order to achieve long-term environmental goals in a complex city, such as Mexico City, but as long as the Mayor is consistent with his decisions, people will recognize his aims and efforts,” she told City Mayors. The left-wing government of Mexico City is known for its progressive agenda, particularly in areas such as public participation and consultation mechanisms, which led to nearly 1.5 million people participating in environmental public consultation during the past three years. Minister Delgado stresses that due to changing rainfall patterns since 1990, water supply problems and a rising population, city government and residents must work together even closer. The main focus will be climate change. Delgado stressed that any progress will be achieved locally: “At the end of the day, while countries are participating in the debate worldwide, local authorities are the ones who are going to implement these measures are expected to deliver”. Mayor Marcelo Ebrard’s government in Mexico City has made improving air quality an important priority of his administration. As a result, during the plan’s first year of implementation, greenhouse gas emissions fell by two per cent. The climate action program is part of a 15-year green plan for one of the biggest cities in the world. With an extensive and passionate career on environmental issues Minister Martha Delgado recognizes that there is still a lot to do for the environment in Mexico City: “Adoption of climate change commitments is a local matter, mayors need to allocate resources and deliver to citizens, so mayors should lead the cause. Today, Mexico City is investing one billion US dollars a year in its climate action program (almost eight per cent of the year budget) and in December 2009 Mayor Marcelo Ebrard was named chairman of the World Mayor Council on Climate Change”. In terms of improvement of public transportation, Mexico City has been recognized by international organizations for its efforts on adapting sustainable ways to achieve urban mobility. Mexico City’s subway system, already one of the world’s largest, is being expanded with a 12th line  an investment of US$ two billion. The City’s extensive taxi fleet is being modernized, with the government providing funds to replace older vehicle models with new, environmental-friendly ones. Also bicycle mobility programs have been introduced by investing in 1,000 bicycle pick-up points in city centre locations. The Mexico City minister recognizes that, while cooperation and understanding between citizens and the government are stronger than ever before, some of the initiatives have been polemic: “We have proposed a plan to the community for mandatory public transportation for students attending the largest elementary and secondary schools. We are positive that if we set up a system for all public schools to transport their students in environmentally friendly buses, we can significantly reduce emissions as well as traffic congestion. However understandably, there are people who are reluctant to allow their kids to ride on public transportation run by the government. We are working with them to find a solution for this situation, but on the whole, people are remarkably willing to cooperate”  she says. Water access is a complex problem for Mexico City. According to Minister Martha Delgado, this year there are 21 million people living in the area known as the Valley of Mexico, with 42 per cent of them in Mexico City. It is estimated that the over exploitation of aquifers will be of 120%, 6.3m³/s of residual waters will be generated and only 1.2m³/s of them, will be treated. Because of this, a Special Commission for the Overall Management of Water was created, with the purpose to make sure that the total provision of the water requirements of the population can be achieved without any risk for the future generations. Mexico City’s climate action program therefore includes measures such as: investing in water infrastructure to ensure that demand can be met; minimizing losses due to leakage and encouraging businesses and consumers to reduce usage and waste. A new water pricing system will be implemented this year, which is designed to promote conservation. Regarding land conservation, 59 per cent of the total land area of the Federal District of Mexico City is designated a conservation area. These areas are under threat from illegal development, logging and fires, which impact regional rain patterns and climate change. Mexico City has created a special police unit of 1,500 officers to enforce environmental regulations in the land conservation areas. The city has also planted 1.4 million trees. The Government of Mexico City is taking the lead on many of these issues. However, there is long-term plan ahead with costly measures and decisions. But, as it was proven in the past, citizen participation in local government decisions seems to be working and, as a result from these collaborative efforts, the citizens of Mexico City have a more clear future which will allow them, once more, to enjoy the magnificent volcanoes as part of Mexico’s City skyline. The authorities are closing down Mexico City’s vast 56 million-tonne garbage landfill site at Bordo Poniente in a year’s time with plans to replace it with a recycling centre. The 420-hectare facility, opened in 1985, can no longer cope with its daily dose of 12,500 tonnes of waste. The proposed 300-hectare Integral Centre for Recycling and Energy (CIRE), at an estimated cost of $140 million, is to be built as part of a program announced by Mexico City’s recently created Integral Management of Solid Waste Commission. This was initiated by Mayor Marcelo Ebrard and the city’s environmental, health, finance, and public works departments, together with the Science and Technology Institute, with the objective of raising money through plastics recycling, the generation of compost and by exploiting the biogas emanating from landfill areas.